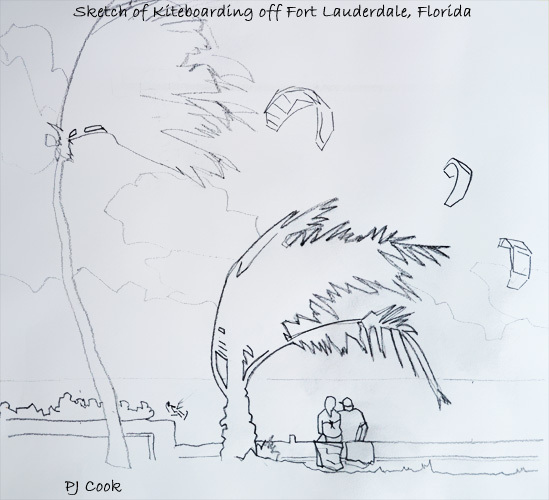 Here is my latest drawing of kitesurfing on a windy day off Ft Lauderdale beach. As you can see by the bend of the palm trees how windy it was that day. We had strong winds here for over a week and the kitesurfers were at all the local beaches. As I was looking for an interesting view I spotted some people sitting and watching the kitesurfing. The palm trees were really bent over from the wind, I did not exaggerate how bent over they were. In this drawing I focused on shapes and how I could use the shapes for a good composition. I did the tree in the center with one continuous stroke, not lifting the pencil off the paper. So more of an outline of the basic shape. I went back in to add the holes between branches. I basically did the people the same way. I think it does help me capture more of a gesture of the subject and better shapes. I added the kites and the palm tree on the left last. I may work on connecting and merging some of the lines and shapes so I’m not showing every detail, something I’m working on. I will probably paint this in watercolor and post it here on my blog on Saturday. So check back to see how this kitesurfing painting comes out.